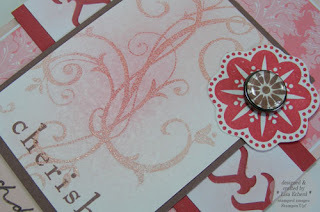 For this week's color and sketch challenges at Splitcoaststampers this week, I chose the Baroque Motifs set from Stampin' Up! The colors are a wonderful collection of red and pinks that will soon be retired: Ruby Red, Blush Blossom, and Cameo Coral. 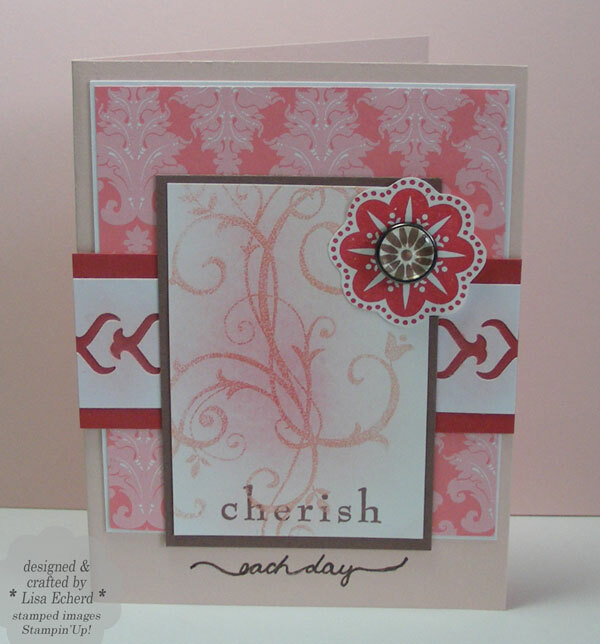 The flourish is stamped in Blush Blossom craft ink and then embossed. I used Stampin' Pastels to add a little Ruby Red and Cameo Coral working from the darkest in the center out to the lighter shade. I'm not sure about this punched border. I was playing with an old Papershapers punch. The white on red was too stark so I added more pastels to soften the look a little. Build-a-brads really make the simpliest stamped image classy. Ink: Ruby Red, Blush Blossom, Close to Cocoa and Cameo Coral.